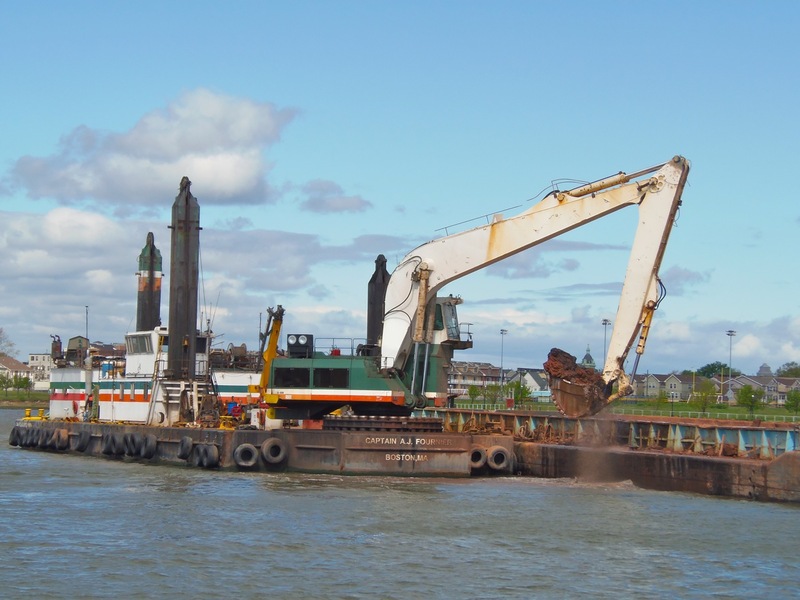 Yesterday’s post featured a dredge that vacuums diamonds off the seabed. I’d thought this remained mostly still the stuff of Jules Verne, but here’s a fairly recent assessment from the Economist, a half-decade-old article from Der Spiegel, and a southern African treasure trove of several sorts. 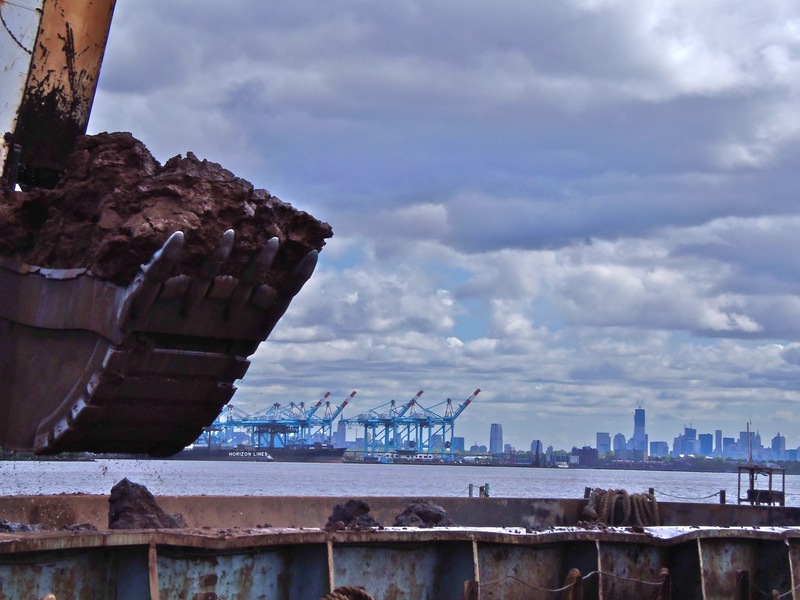 Dredging in the sixth boro allows trade worth billions to proceed in orderly fashion and without . . . groundings. 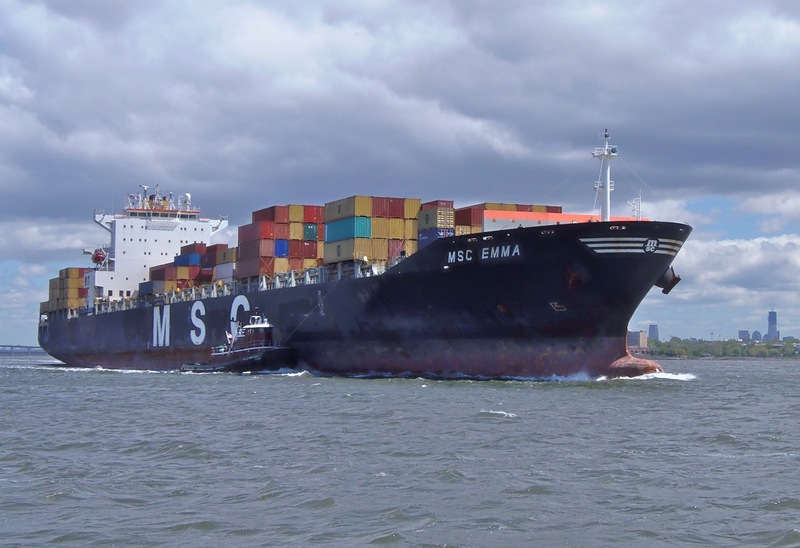 Here MSC Emma heads southbound out of Newark Bay and toward the Bayonne Bridge, KVK, and … the Atlantic. Notice the tallest building in NYC (as of today) about seven miles away in distant Manhattan across the peninsula of Bayonne. For outatowners, check out the lower left of the AIS screen capture below; doubleclick enlarges. See Elizabethport? Move toward the right along the bottom . . . see Kraken? The foto above was taken roughly where Maurania III appears. 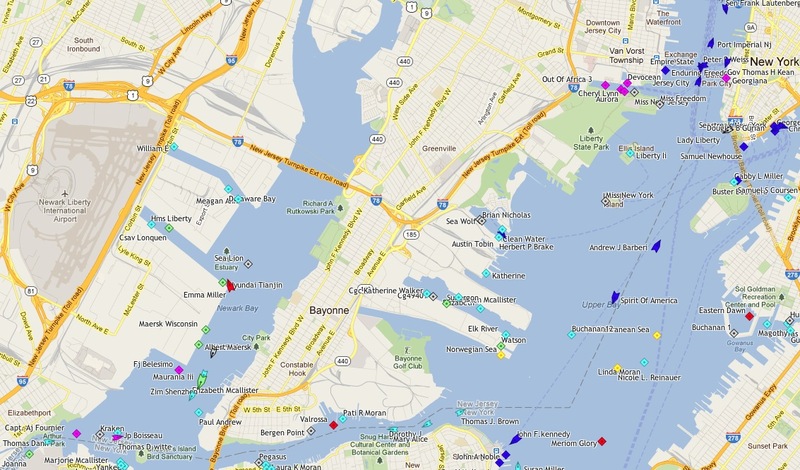 Now move across Bayonne toward the upper right and you’ll see lower Manhattan, where 1WTC is located. The sinuous body of water along the lower center of the image is the KVK, the west end of which is crossed by the Bayonne Bridge, which you’ve seen at the top of this blog since post #1. 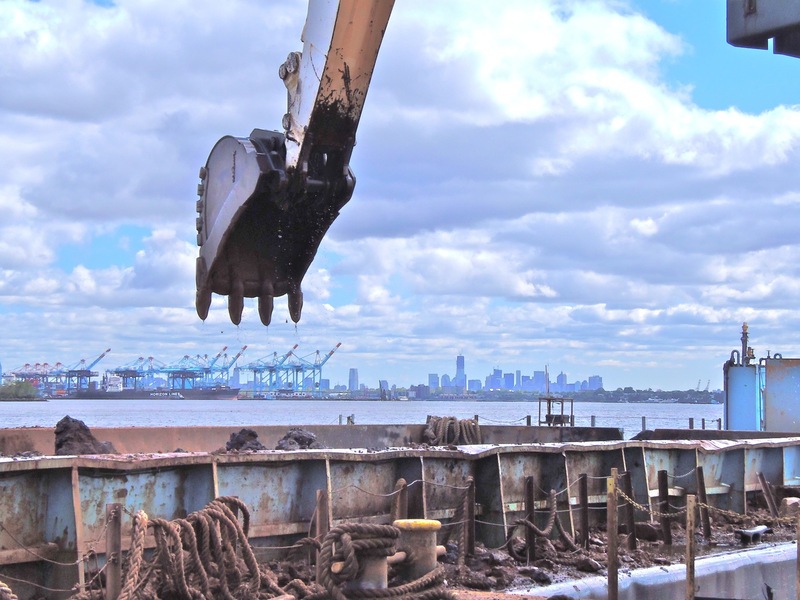 Below is the backhoe dredge Capt. A. J. Fournier, represented by the lowermost left magenta diamond. Elizabethport’s St. Patrick’s Church is in the background between Capt AJ’s spuds, which appear of different heights because one is implanted in a deeper portion of the channel than its mate. 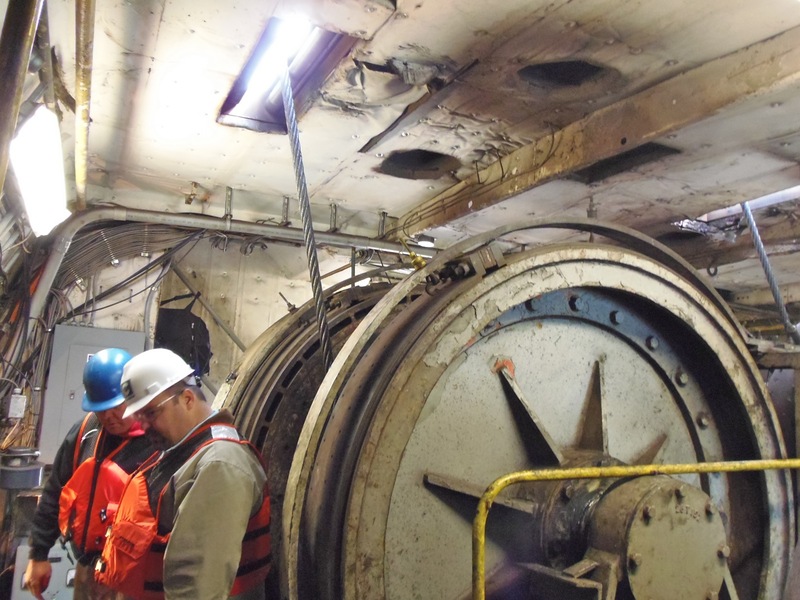 Finally, here crew inspects the swivel motors inside the cabin of F. J. Belesimo. Notice the diameter of drums that control the clamshell bucket. 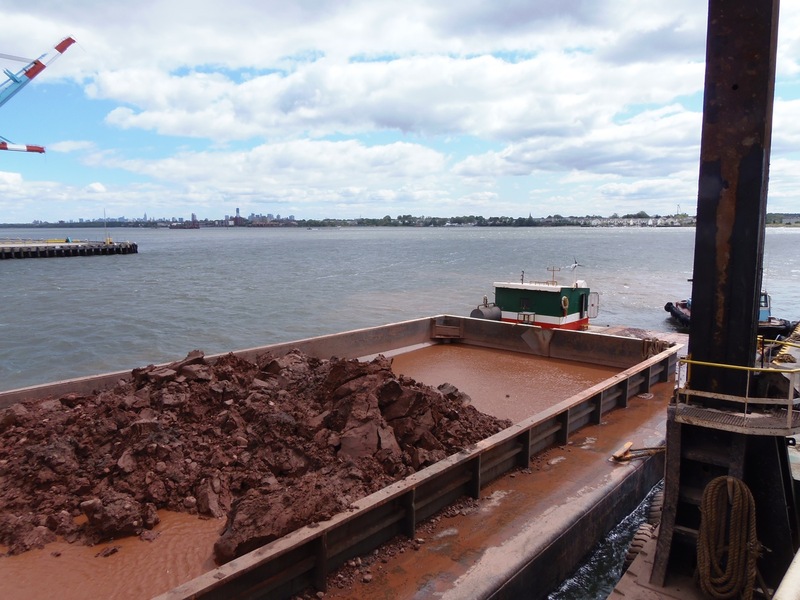 Again, many thanks to Frank Belesimo for this tour of Cashman’s Newark Bay/Arthur Kill project. Any errors are my own. 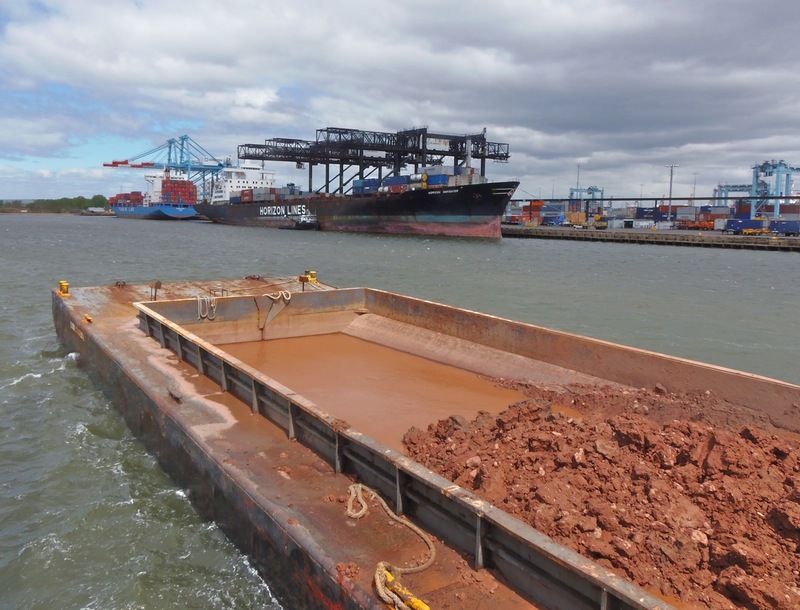 And all this dredging relates to all the digging down in Panama. Unrelated: Note the new button . . . upper left. 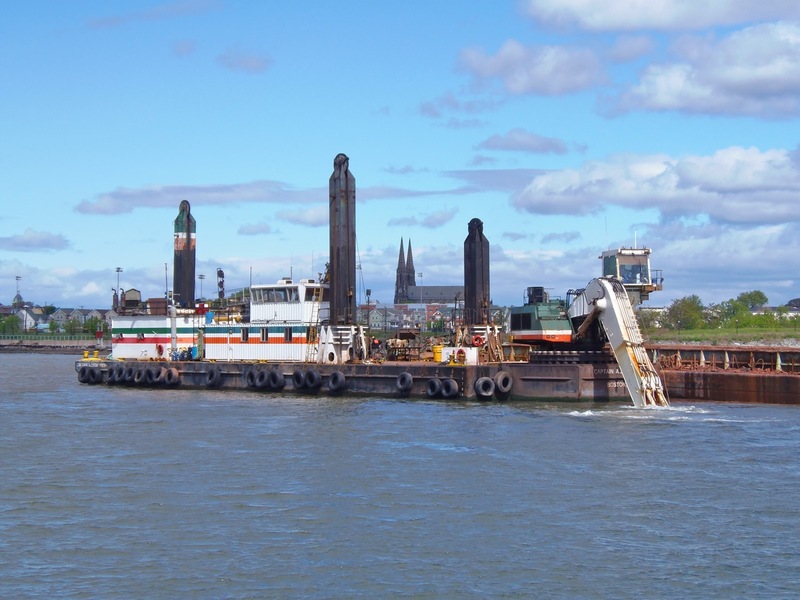 Tug Pegasus (1907) and Waterfront Museum Barge aka Lehigh Valley 79 (1914) have teamed up in a grant application for $$ for preservation work each vessel needs. As a component of the decision-making about who gets the $$, Partners in Preservation have a “socialmedia-meter” running from now until May 21. To help Pegasus and Lehigh Valley 79 register high on this “meter,” you can do two things from wherever on the planet you may be: 1) befriend them on Facebook and get dozens of your friends to befriend them as well, and 2) vote DAILY here. DAILY! Seems like a crazy way to run an election, but . . . that’s social media and in this case, the cause is worthy. Here’s the Facebook link. For some background on Pegasus and its captain Pam Hepburn, watch this great video from almost 20 years ago. And you must watch this. . . a video made last week in which Pam and David explain their project . . . most compelling.